You might think I’m a competent copywriter. But I hate my own tagline. Taglines are probably the hottest debated pieces of content in any marketing department. I’ve been there. Tagline debates are time-consuming, energy-slurping, and emotionally draining. Yes, it can get that bad. 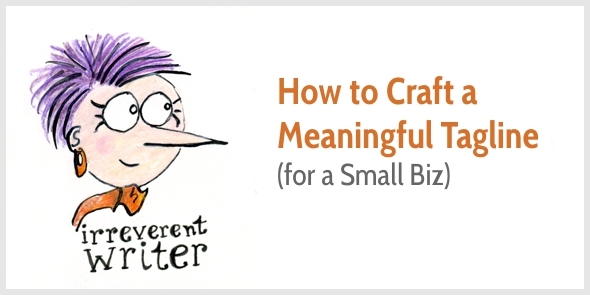 But recently, I’ve wondered whether crafting taglines is a waste of time for small businesses. Could I simply delete my tagline? The traditionally schooled marketer in me shivered. No tagline? How could my business thrive without a punchy tagline? The idea seemed crazy at first. That temporary tagline has stuck for over four years, and I’ve comforted myself with the idea I have a business name I’m proud of. But still, that tagline kept nagging. It’s not punchy. It’s not memorable. It lacks oomph. Is my business that boring? A tagline communicates an aspect of a brand in a punchy sentence or soundbite. Taglines help a company stand out from the competition; they’re usually communicated together with a logo. What’s the difference with a slogan? The difference between slogans and taglines is fuzzy, and many marketers use the words interchangeably. A tagline tends to be a semi-permanent soundbite about a company, while a slogan is used in a specific marketing campaign. But why do we all know these taglines from Nike, McDonald’s, Avis, and Apple? Yep. Because they’re advertised like crazy. Big companies spend millions of dollars so these slogans stick in our minds. We see them on billboards, TV ads, product packaging, marketing flyers, brochures, and when we pass their stores. But as small businesses, we don’t have these big-bucks opportunities to advertise a catchy tagline. So, does a small business need a tagline? As I started preparing a website refresh, I dug into the topic of taglines, and noticed many businesses go without one. Orbit Media, for instance, is a Chicago-based web design agency … without a tagline. We used to have the tagline “digital design and production” but we dropped it. Taglines add visual noise, so there is a cost to adding one. That cost would need to be outweighed by the benefits to the visitor. But visitors typically find us by searching for web design related phrases. They already know what we do. Those extra words weren’t really adding any value … but they did add clutter. Design (and writing) is an art of subtraction. When you can’t remove anything else, you’re done! With that in mind, the tagline had to go. Pamela uses her tagline as headline on her home page and mentions it on her About page. Her website header doesn’t have enough space to display her tagline on every web page, but she uses it in her email signature and will soon redesign her blog update emails to include this tagline, too. What about your tagline? And my tagline? Where do you want to use a tagline? Consider business cards, email signatures, your website, social media profiles, and any printed marketing material. What information should your tagline communicate? Consider what you do, or for whom, or how your customers benefit from working with you. One specific situation exists when you must have a tagline. And that’s when your company name doesn’t tell people what you do or how you help them. Many accountants, lawyers, builders, and freelancers use their name as company name. In this case, the aim of your tagline isn’t to be memorable and punchy. It’s simply to clarify what you do. Big business marketers might kill themselves laughing about such simple taglines. Where’s the creativity? How do you stand out? But everybody knows what Nike, McDonald’s, Avis, and Apple do. And hardly anyone knows who you and me are. Plus we don’t have a big budget to advertise our slogans so they become memorable. So, as small business, it’s more important to communicate clearly what you do. Be simple and direct. Hannah Green | Speaker. Author. Trainer. Hank Meadows | Educator. Consultant. Keynote speaker. But these words aren’t meaningful. Speaker about what? Trainer in what? For whom? Or why? Creating a strong tagline means choosing what’s most important. Be selective. What should you communicate to people who don’t know you? What’s absolutely essential? Have you decided you need a tagline? But scratching your head because you don’t know what to write? I help small biz owners and solo-flyers become confident writers and find their voice so they can attract their favorite clients and sell more. Find your voice. Grow your biz. Shopify has created a tool to create a tagline for any business. Hmmm … Use at your own risk. I printed business cards 5 years ago, but I rarely use them. I don’t go to networking events, and rarely visit conferences. I don’t do client meetings. My weekly emails don’t have a fancy design; they look like personal emails. So no tagline required here. My website visitors are either repeat visitors or people who searched for something like “how to improve writing skills” or “how to write web content.” They already know what content I offer. My business name already gives a hint what my website is about, plus it adds a dash of personality—this site is not about pushy marketing; it’s about enchantment. Conclusion? My tagline clutters my website header, so I’ll remove it. I don’t need a special tagline for social media. And my Twitter bio currently states: Irreverent writer on a mission to stamp out gobbledygook. I’m happy with that; it doesn’t need to be shorter. They glance. They skim. They quickly make up their mind whether to hang around on your site or not. So why do they come to your website? And what’s absolutely essential to communicate? Avoid clutter. Embrace brevity. Boost clarity. PS Thank you to Irina Bengtson for inspiring this post. Henneke, I love this one! I think mine is now too long after reading your suggestions here. “Sure-Fire ways to succeed in Social Media and Content Marketing”. You are right about people not wanting to spend too much time reading these days. Everything is so fast paced. My only question is I think we may need a tagline for SEO purposes? This page title shows up in the search results, but you don’t see this text on your home page. (And you also want to make sure that your page title is different for each web page so each web page targets a different key phrase). Where do you use your tagline? Is this for Inspire to Thrive? You can probably shorten it to: Social Media and Content Marketing. That was a masterclass on tag lines! I need to revisit this as I upgrade my own sites. And btw, I love your Twitter bio. Have a great Easter weekend! I hope you’ll have a great Easter weekend, too! Wow. Why did I fret over my tagline so much? ? thank you for making me feel better! Indeed. That created a lot of non-sense. My situation is very much like yours — 99.9% online. “Light-Hearted Cartooning Teacher” <= I like this one a lot! Yes.. you don’t really need one. Irreverent copywriting coach would cover it all, though. The funny thing is you say nowhere that you are about writing. Your website name is enchanting marketing instead of: enchanting business writing or something like that. How do you explain THAT? PS. Copyblogger has no tagline either, I believe? Ps No, the website has one. I was thinking of the blog. I’m not so fussed that my business name doesn’t mention “writing.” After all, all my writing advice relates to marketing. My courses have a strong marketing foundation, too. If the brand name had been “Enchanting Writing,” then people might think I’d be a fantasy writer or something like that. I also think that the banner with my snackable course helps focus the mind on writing. Copyblogger is one of the very few companies who have a tagline in their website header. Even the likes of Apple and Nike don’t have a tagline in their website header. The more I think about it, the more I think taglines are from the “print” age. We don’t need them on websites. Perhaps we only need them on a LinkedIn or Twitter profile (more as a personal tagline) or on a business card if the company name isn’t clear. I think Copyblogger can delete their tagline. What does “Words That Work” add? Fussed? Let me look that up… busy? Yes, yes, yes. All agreed. Still, you teach writing. POWERFULLY EFECTIVE CONTENT MARKETING, and I mistook it for the tagline. But Indeed they have WORDS THAT WORK as a tagline. In Google search it proves to be part of a longer line: Copyblogger – Words that Work for Digital Marketing. I agree. They don’t need one. Copyblogger says it all, anyway. I once heard BC complain, in a podcast, that he picked the wrong name. But I don’t think so. I think many people see taglines as if it exists separately from the rest, as if it alone carries the burden of clarifying what the site is about. But a tagline never exists out of context. There are always other elements present. And this is exactly the case with your (Henneke’s) snackable writing course banner. It is always there. So there is absolutely no need for a tagline, IMO, for the same reason Orbitmedia has no tagline: If it only adds clutter but doesn’t add clarity, what’s the point? Yes, that’s a good point. We often try to do far too much with a tagline. It’s only a few words! I’m having the same debate with myself (often dangerous) and trusted advisors (often confusing) and I’m edging towards having a tagline/slogan, that not only makes a statement, but also raises a question in the readers mind. It’s short (ish) 9 words, and my plan is to refer to it in my introductory videos as a lead in, because it sits at the heart of what I do. I will also refer to it in marketing, courses, literature etc. So my point is, rather than having a tagline for the sake of it, my plan is to use it as a conversation starter, as a continuing reference point to drive my message, AND, as a check point for myself to measure relevance for whatever I do. I haven’t posted the tagline for obvious reasons, but I hope to soon, with my new business launch. I like your idea about having a tagline as a conversation starter! I don’t know what you have in mind as tagline, but my hunch is that I wouldn’t use it on every single web page. Perhaps follow a similar principle as Pamela Wilson – use it on your About page, perhaps your home page, and in your email signature. You could even print it on a business card. Opening and starting your videos with your tagline sounds fab, too. I like it Henneke. Your view cuts through the formulaic hyperbole that marketers often spout, not necessarily based on experience but what they’ve been “taught”. I also agree that unless you spend big on advertising, word of mouth is king and that requires a business name or your own name, only. Simple. Keeping it simple is often the best advice! Your content is just so fun to read! My site is Common Sense Living, and I’ve tried bunches of taglines that sound like phrases you see everywhere. I’m now toying with – When you’re tired of living a crappy life. Now that I’ve written that, I feel brave enough to test it. Go for it! It sounds good. Very helpful article. It seems that the word “platform” (word that was popular for a while) is similar to a tagline. Yes, that’s true. “Platform” is vague. As is “solutions” which was popular for a while, too. Always the voice of reason and clarity. Great article, Henneke. I’m rethinking my tag line now too and may just remove it. I’m glad you enjoyed it, Shelly! Good point about cute or edgy taglines: They only work with lots of advertising behind them. I’ve been using Customer Experience and Brand Story Marketing for my business, but I have come to realize my market doesn’t know what that is. So, for the time being, I’m using: Going further with social media and content marketing. Boring as heck, but it’s a start for those that are looking to put me in a box so they can hire me. People have to know the conventional thing we do first. If a tagline can do that AND be interesting, it’s a win! I think it’s easy to forget that people might not know the terms we use ourselves all the time. That’s the curse of knowledge! When considering your tagline, it’s worth thinking about who sees what where—what’s the context? For instance, on your home page, your company name (Landscape Digital Institute) gives already a good indication what you’re about, and your headline completes the story: Digital Marketing Training for Landscape Pros. You might want to think about your subhead in terms of how do landscape pros benefit from your training, but you probably don’t need a tagline here. Where do people who want to hire you as a speaker go? You might want to use “keynote speaker” as part of your personal tagline on your business card, social media and your About page (or Speaking page). It was a couple of years ago that my tagline came to my head (it’s in German and there really isn’t a proper translation because it plays on “Wörter” vs. “Worte” – both “words” in English). I was literally standing in the shower when I had the idea. I didn’t even have a business back then. But when I started some time after that, I chose it because it stuck with me over the time. So it just came to me. I neither invested time nor money. And although I have a somewhat “creative” tagline, I would recommend using a more descriptive one. Especially for small businesses. And even though I use a tagline myself: I think, investing enormous amounts of time and money is a complete waste. Better use that energy to craft compelling messages for your target audience. That is much more likely to drive sales. And if nothing else works, just use “XY is the only way to be happy” 😀 Loved that one! That’s a great story, Chris. I agree with you … when you strike gold, keep it. Thank you for stopping by again, and happy Easter! You made a good point about taglines that I have always had running in the back of my mind. You confirmed it for me. Taglines are noisy and often in the way. Nike’s “Just Do It” was short, memorable and promoted everywhere and the promotion was probably the key for it’s success. Small businesses don’t have that luxury huge promotion budgets and too many times, and I am guilty of this as anyone, we attempt to be clever at the expense of communicating what we do or truly need to say. People visit websites to solve problems, not find clever sayings. The content of the page is what convinces someone click on the contact form, not a memorable tagline. Content sells on the web, not a pitch. And this is so true. I like how you put it. Let our content speak for itself. Thank you for the compliment. I appreciate that very much. Yes, “flakiest marketing.” That is sort of phrase some people will find interesting and feel compelled to click the “Learn More” button just find out what flaky marketing is. With the right graphic, flakiest marketing could at least be kind of funny and irresistible to some. Now that I think about it, those could be my kind of customers. Or it’s the kind of phrase someone is going to read and decide that’s too weird to trust this guy with my money and click back to the SERP’s. And thanks for cleaning up my stray comma. Flakiest marketing is edgy and might attract the right customers. It’s hard to say – you can ask some of your favorite clients who you think will give you an honest view? That would be the best solution, just ask. Yes, I think it’s risky just to go for it. Consider showing clients two or three options. I remember our discussion on taglines during the Copywriting class, and it’s still a pressing issue for me. I like your thoughts and approach – use it if you need it, if not – don’t waste your time and energy on it. In my case, I think I might need it because the name of my website “LoveGrowBeHappy” is not exactly telling the audience what I (can) offer. I had started the exercise before I was done with the article 🙂 To me, it’s still about figuring out what I want to offer but I think I’m getting somewhere. You have to look at the context, too. What else do people see when they arrive on your website? For instance, on your home page, the call to action for your email course (together with your name Love Grow Be Happy) gives people a good indication what you’re about. My name “Enchanting Marketing” doesn’t tell people exactly what I offer either. But it gives enough direction. Then the rest of the content gives more guidance. My existing tag line “woo you life and relationships” will go when the course comes. At least it’s how I imagine it. Then I wouldn’t have any tag line. Do I understand you correctly, Henneke, you don’t think I need one? I hope you enjoy better weather than we are having here – cold and rainy. Yep, that’s correct. I don’t think you need one. If you would get another tagline, it’ll only distract people from your free course. You want to focus attention as much as possible on joining your free course to maximize email subscribers. Nice post! I’ve been playing with making my bio more specific about what I do. Because nutrition and wellness is a very big area. When I saw the option: Irreverent copywriter and coach. I thought. Yes. That’s perfect. But you’re right, you don’t really need a tagline. I still use “irreverent copywriter and coach” in social media profiles (or slight variations of it). I just don’t think I need it prominently on my website. I’m becoming an avid reader of your blog, Henneke. Another great post here. I love the point you are making (something I haven’t seen in any article about writing taglines so far): It’s ok to omit that tagline! And I see it resonated with many people who have commented. Most articles about taglines I’ve come across are about famous taglines and, therefore, big bucks marketing. We need more common sense for our small businesses. Just like you do perfectly for your own tagline! I write advice for home-educating moms. No one knows me, or if they do, many are not willing to admit it. Ha! I have an ancient site that is mostly an archive of advice for home-educating moms, called “Home’s Cool!” Although it is a coveted name in my niche, newbies do not always get the pun. (Once they do, it’s an instant memory kick, so it’s good.) So, I need a tagline, and have chosen “Stop merely dreaming about it; GO HOME!” Many would disagree with the philosophy, but few forget where it is. My second site–which I try to keep current–is Bible-based counseling for women who have been wounded by the mistreatment available to all women, worldwide, and is entitled “The Conquering Mom dot com”. Again, maybe not completely indicative… So another tagline: Woman. God’s way. It works. As for my business cards, which I also use in my role as a writer, I have the three-word thing you mentioned, almost: “Writer. Speaker. Professional Mom.” Folks love that one. 🙂 Seriously, I get compliments on it. Ha! You are wearing so many hats. I don’t know how you can keep it up! I love this because other moms (and dads) can immediately relate to it, and it shows a nice touch of humor. The “Professional Mom” gives a good indication what you’re speaking about, so it’s not vague like the examples in my post. For instance, “Writer. Speaker. Educator.” would be vague, but your version isn’t. It gives a nice contrast, too. Stop merely dreaming ; GO HOME! Actually, my two sites overlap a lot, as yours could be said to consist of several expandable topics, such as writing, marketing, and blogging. One difference is that I wanted to stop writing about homeschooling so much and leave it more as an archive for referral, since I’ve retired from that, and give so much more time to the counseling that I thought it deserved its own look. The entire truth is that I never completely wanted to do the blogging, but was told that I needed to have a web presence, to find a publisher. So I blog (and do my own laundry, haha) and the book languishes in the files on our desktop. She sighs. I don’t really think of a tagline as a description of what a company does. Because it adds no value to the company’s name. For instance, your accountant. His so-called tagline could describe thousands of other people. Your own (soon-to-be-former) tagline actually detracts value from what you do—but not much, because it’s so innocuous. You’ve done such a good job with your name that you don’t need to say more. IMHO, a tagline should be about what you stand for, and be more about your customers than yourself. Enchanting Marketing does a great job of saying what you do for clients, what you stand for AND what your customers will be able to do when they read your books and take your courses. All in two words! The well-known business author Clayton Christensen believes that companies should understand on a deep level what the job is that people would hire them to do. (He calls it ‘The jobs to be done’ theory.) This is not a bad way to think about taglines. But to get it right requires research into the needs and motivations of your audience—and self-examination to understand where those feelings intersect with what you do best. I agree with Clayton Christensen that companies should understand on a deep level why people hire them. But I don’t think we can expect the tagline to communicate all of that. We have other content on our web pages to help us connect at a deeper level. My accountant, for instance, had been suggested by someone, so I went to his website to learn more. I knew I was on the right website because his “tagline” said “Chartered Accountants.” That’s all I needed to know before reading on what he could do for me and how he might be different from my former accountant whom I didn’t get along with. I think it’s impossible for each accountant in the UK to come up with a unique tagline to communicate their unique values. There are too many of them, and I don’t need a unique accountant. I need someone who’s a good number cruncher, who keeps to deadlines, who I can call when I have a problem, and who understands my type of business. It’s nice to get along with him, too, but his tagline doesn’t need to explain that to me. I can figure that out from the look and feel of his site, his blog posts, and then a phone call. Yes, we could have a (friendly) debate. You said you didn’t need a unique accountant, but then you listed all the qualities you hoped for: Keeps to deadlines, someone you can call with a problem, understands your type of business, easy to get along with. Just based on that, you or I could give him a far better tagline than ‘Chartered Accountant’. A recommendation from a friend will always be the most persuasive ad. But for people who don’t have that, one simple line could make all the difference in deciding to choose what would otherwise be viewed as a parity product. It’s not that I disagree with these suggestions. I only think that they don’t need to go in a tagline. When you look at well-designed websites, you’ll find very few with a tagline because a tagline adds clutter. I think this is more and more driven by mobile responsive websites. There’s not enough space, so the key message needs to be communicated, and, in this case, that’s letting me know they’re accountants. Well, the moniker ‘tagline’ is tricky. Because most people think of it as something that gets stuck beneath your logo. But I think of it as something that defines your values. If it’s so inconsequential that it just feels like clutter (in whatever medium), then sure, why bother? Apple once used the iconic phrase ‘Think different’. But it wasn’t called a tagline because they didn’t put it in small type beneath their logo. Thank you for defining “fussed.” ? In today’s content marketing world where more and more folks are removing their comments section, your site is one of those real gems where you can get great content from the post AND from the comments. If I had a nickel for every guru that talked on and on about engaging with your prospects and customers…well, here’s a site where the engagement occurs in the real world and is a delight! I feel lucky with such a lively and smart community. The comments always add a lot of value to the post (I’ve heard from someone who comes first to read my post, then later returns to read the comments!). The comments help me sharpen my thinking, too. I’m grateful! Thank you for that Henneke. I’ve been thinking about changing my tag line to one of those three word ones. Glad I didn’t now. For anyone who is inclined to comment. I’m wondering if I need a tag line to clarify my website. The name is Life Is Better With Tea. Without a tag line I’m not sure you would know what the site is about specifically. My tag line is “simple healthy tea recipes for body and soul” I think that limits me to recipes but I also talk about tea and how to brew along with the health benefits of tea. My new tag line was supposed to clarify that and not limit me to recipes. It was going to be “Stay healthy. Live well. Drink tea”. Or I could just scrap them both. Any thoughts? I’m not sure you need a tagline. Your name “Life is Better With Tea” tells us a lot already. I don’t know what the limitations are of the theme you’re using, but I’d use something like “Tea recipes for body and soul” as a prominent headline on your home page. I don’t think you need “simple healthy tea recipes for body and soul” on every single web page. If people land on, for instance, a recipe page, then it’s also instantly clear this is about tea recipes. I love ❤️ this discussion Henneke. I’ve been freelancing for about 2 years now. My business name is my name and the service (copywriting)I offer. My tag is just more detail about the type of writing I do. Every now and then I ? yup you guessed it…pine for a creative, catchy tag that rolls off the tongue. But now, thanks to your logic, I feel I’ve made the best choice. Thanks for the clarity!! But the rest of your site makes it pretty clear you’re a B2B copywriter, so it’s not really necessary. Like you, I’ve been pining for something more catchy for years. But I’ve stopped pining a few weeks (months?) ago when I realized I could simply remove my tagline. Such a relief! Always great to receive, your weekly healthy dose, of copywriting vitamins supplement. I’m looking forward, to getting my relevant marketing chunks of info, in a capsule of easily digestible tablets. Thank you for your lovely comment. I wish you a wonderful Easter, too! Henneke, I DO say B2B Copywriting. Did you see that on my Facebook page? You’ve just alerted me that I neglected to add B2B when I made that change months ago. YIKES. Thank you!! When I was in grad school, the big thing for top companies was all about “excellence in business,” “continuous improvement,” and “innovation” so EVERY company became those striving for excellence kind of tags. Some helped their audience a little by adding “striving for excellence and continuous improvement in accounting,” for example. What I’ve learned about web content, and from you, is online has to be about UX, first. Respecting readers’ time and helping them get to know what you’re all about. My first tag line for my online freelance writing biz is: “I’ll write for your business as if it were my own.” I wasn’t thinking (because I never had heard the term UX) at the time or knew anything, really, about web content in particular. Now, instead of a freelance writer for business, copywriter, or writer of any kind, I think of myself more as a “Content Creator” but, still it IS all based on quality writing so I still use and feel like that original tag works. Though, I often don’t use it in conjunction with my visual LOGO design because I think it speaks without words! Hmmm. A mixed tag line message, I am! As your business name is Write Mix for Business, I’m not sure you need to worry about a tagline for your company—you make it instantly clear that you write for business. So that’s well done! For a personal tagline (for social media), I like content creator. To stand out from other content creators, you might want to think about an adjective that hints at how you differentiate yourself from others. Just like I use “irreverent” and Alison (somewhere in the comment section, too) uses “light-hearted.” This can be a nice way to set the tone. Always good to see you again, Sue-Ann. Happy Easter! Honestly. I didn’t know what a tagline was until reading this post. Or that I needed one. I don’t feel the pressure to get one either. I will probably think about it in the next few weeks. And decide if I will create one. Thanks. It looks like you already have a tagline. I just can’t read it as it’s Danish … but it’s the text below your name in your logo (kroppe som laerer). I don’t know what it means! I like it. It’s intriguing and still hints at what you’re about. I’d not even spotted you had a tagline, Henneke! How unobservant. I had clocked your logo though: the way the ‘g’ of ‘enchanting’ gently entwines with the ‘G’ of ‘MARKETING’, as if it’s giving a helping hand. Lifting it. Discretely demonstrating what you do. Neat. Great conversations! I’ve read everyone. I’ve learned alot and the conversations generated a few questions for my next project, a website. Any thoughts? I so enjoy your blog posts and the commentary. Great work! Happy Easter! I don’t have any experience with Etsy, so, I’m not sure whether the tagline has impact on search engines. You can play a little more with different words. You can use a thesaurus to find alternatives for glamorous, such as dazzling, exquisite, gorgeous, lovely, seductive. E.g. Exquisite Wedding Accessories, Hand-Crafted to Your Specifications. Think about which words suit your brand and your designs best. What an excellent post! And rather timely as I’ve been working on my services site over the past few weeks. I thought it was looking OK and that I’d conveyed my message on my homepage. Until somebody said, “What do you write about?” I’d said who I wrote for (small biz) but not on what topic. I know it’s slightly different to the tagline, but it’s still about conveying your message. PS – I’m another who never noticed your tagline. But I noticed your content. And it’s smashing! I don’t think a tagline can communicate everything (what you do, for whom, how your customers benefit, and what’s different about you). On a home page, you’ll also have a headline & subhead to communicate more. It’s about pulling your web visitors into reading your content by confirming they’re in the right place and making them curious enough to read on. I loved this post, mainly because I help write taglines for businesses. Invariably we argue about why it should be simple and short, especially because of the SEO angle. My tagline is “Did you smile today” and since I didn’t confine my blog to a niche, I show up on all sorts of things (or so I’ve been told). Happy Easter, Henneke! (You know I read all your posts even if I am a lazy bum about commenting! I will remedy that as an Easter resolution. By the way–in India it is the Tamil New year today!) Hugs! I hope you had a lovely Tamil New Year! Thank you for stopping by to leave a comment, Vidya. I appreciate it! I like it Henneke. Brief, clear, simple and powerful. I nabbed a really good tagline 3 years ago: how to retire to a life of island hopping through smart blogging. Vibes well with blogging from paradise. Most understand the benefits of how blogging intelligently helps you become a full time blogger who circles the globe. Easy to see that dream. But even without the tag line I could still goad folks to see that Blogging From Paradise is beneficial in and of itself. The challenge for most bloggers: whether to tagline or not to tagline. You summed it up well: if readers easily feel the benefit of your site name, no need for a tagline. If however they need expounding, or greater clarity, because the site name is a person’s name or kinda generic, go with the tag. Ditto with generic taglines. We think in terms of benefits to ourselves, not in terms of vague professions. Your example: we know what your account does and how they can help us. Clear to see. But if someone is an author, what niche do they cover? What 1 of a million niches? Same deal with a speaker or trainer, or blogger. I help folks retire to a life of island hopping through smart blogging. If people know that, they know that clicking on my coaching page means I can help them become pro bloggers who travel the world, or even, pro bloggers in their home town, because many of the same concepts apply to both niches, or both blogging lifestyles. Gotta get super clear to make this tagline thing work well, so people easily see and feel the weight of the tagline and how it benefits them, how it improves their life. I think your business name & URL (Blogging from Paradise) is brilliant – it instantly evokes a strong sensory image, and connects the what (blogging) with the why (enjoying life in paradise). I noticed your business name is not in your site header. Does your theme not allow it? Thank you for stopping by, Ryan! I appreciate it. Thanks for that question 😉 This is one change I’ve been meaning to make. I have my biz name on the home page but need it on my blog pages, in the header. Ha, yes! It’s just like with About pages—they’re fun to write for other people, but hard to write for ourselves. Why is your URL different from your business name / logo? That’s a legacy from the past. At the start in January 2013 I wasn’t sure if Soncere would last or change. So using my name seemed a safer/better choice, as that will stay with me as long as I live. 🙂 I do own the url soncere.nl (it redirects). I thought it might be some legacy! I’ve wondered about it before, but never mentioned it to you. Glad you asked, Henneke and thank you for thoughts on this. There is a story behind the name Soncere, but it doesn’t resonate as much anymore as it did at the start. So I’m going to consider it very seriously, as I agree with you about clarity and simplicity. A tagline is important for any business model nowadays. I should be simple and able to attract customers at sudden moment. Thank you very much for your tips. This post will help us to develope an effective tagline for our models. Mine simply says “I write the words so you don’t have to”! Where do you use your tagline? I don’t see it on your website. I absolutely HATE taglines. Mainly because that’s the one thing I’ve always struggled with. No matter how hard I try, it just never gelled into something I liked. Interesting to see many prominent businesses and entrepreneurs ditching the concept of taglines. Makes me happy that I don’t currently have one — or even need to rush and create one. Yes, I’m with you, Andrew. I’m not a fan of writing taglines either, especially not for my own business! No need to rush creating one. Your business name already gives an indication what you’re about. I found your blog yesterday and have been binge reading all the posts. It was quite by accident that I stumbled on this post while I was creating a tagline for a Fitness Studio. It’s hard to comment as i don’t know anything about your business. Do your clients refer to their bodies as crappy? You might want to test your slogan against a more positive tagline. Or alternatively, ask people why they come to your studio and see what answers you get. Is it about feeling more energetic (less sluggish)? Looking fit and lean? Feeling healthier? Being stronger? Sleeping better? Thank you! I was struggling with the whole tag line issue. I feel like I have some space and options now. Great! That makes me happy. This is interesting. Tag line is something I felt the need to add. It adds as an extension to my website when a new user comes up. So they see it is a blog by a person – and after reading the tag line they get a gist of what they might get. I am not sure if it works for now. But it sounds cool. Yes, as your web address is your name, it’s best to have a short tagline so web visitors can instantly see what to expect from you. Thank you for stopping by, Rohan. I’m glad you found this post useful. Pamela Wilson’s tagline would be better as ‘Big branding for small businesses’. Do I need a tagline? If yes, how short or lengthy should it be? It’s a bit tricky with made up names as it’s not always immediately clear to web visitors what they mean. Contexperts may be clear, but I’m not sure how many people would grasp at a glance what Prowritz is. To be on the safe side, you might want to get a tag line or show your website to some people without tagline and see how quickly they grasp what you offer. It also depends on what the rest of your website looks like and how much you specialize. As always, a great article that stimulates thought. Think you should do one on how not to second-guess yourself – which is my biggest problem in writing. Hi Charlotte, I’ve learned that self-doubt and second-guessing ourselves is quite common when writing. You may find these articles useful: about dealing with my inner critic, or how to decide whether your writing is good enough . If that’s not quite what you’re looking for, please let me know and I’ll try to help. Hey, can you please help out with this tagline/slogan? a)By the students for the students. b)For the students by the students. Of the two statements which one is wrong and which one is right? I have a feeling that they are both okay. I just want to have a tagline for a student movement and i have already printed T-shirts with option a. Your slogan doesn’t explain a lot apart from that it’s something run by students for students. It only works if your name explains what your organization does. On the spot, Henneke, just love your writing and information. Entertaining and interesting, as always, many thanks for that. Thank you, Annamaire. I’m glad you enjoyed this one! This is another gem of a post. Not only do I find your material clear, straightforward and easy to implement. It’s actually inspirational. I file all your emails, however I love taking action straight away on what I learn. Case in point, even though I’m pretty new to the online world and hadn’t even thought of having a tagline, I spent a little time mulling over what my tag line would be and I feel this is a good fit – Plans & Possibilities | Live Life, Organised. I’d be happy to hear your feedback. Loved your analysis of taglines. I’ve been developing these for 40 years and really enjoy it. I think it needs to be a version of your Value Proposition, which should be the heart of your brand. In my case, I’m a conversational copywriter who writes to sell. Therefor, my tag line is “Snappy Copy That Sells Stuff”. Works for me. As for your Twitter line, how about “No More Gobbledegook”. And from a branding perspective, shouldn’t all of the taglines be the same? I think there’s a difference between corporate and personal taglines. “No more gobbledygook” doesn’t suit me as it sounds too corporate and it doesn’t convey the action and passion of what I am trying to do. My Instagram presence is more personal than my blog, Twitter or LinkedIn, and I experiment more so that’s why I also use a different tagline. As my brand colors and drawing style are so easy to recognize, I think I can allow myself more freedom to play with my tagline / bio, giving a better indication of what I do on Instagram. To each his own, I Suppose. If it works for you , that’s what counts. Mine works for me. At least for now. Thanks for the post, Henneke. I don’t write taglines very often, and, like you, I’m far from satisfied with mine. However, a client has asked me to write some, so your post has been most helpful.